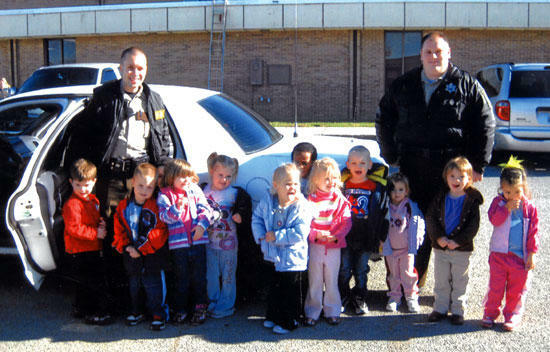 Two Cannon County Sheriff's Department deputies recently visited Woodbury Head Start. Students pictured from left to right are Jacob Blount, Braiden Smith, Abilgail Bly, Tiffany Johnson, Harley Sissom, Xaviar Odom, Chistyn Emberton, Brenden Mooneyham, Jayda Young, Madi Leath and Anna Lara. Ms. Sharon Smith and Ms. Shari Morgan thank the sheriff's deputies for taking the time to visit with the students. Deputies pictured are Travis Turney, left, and Reed Bryson.